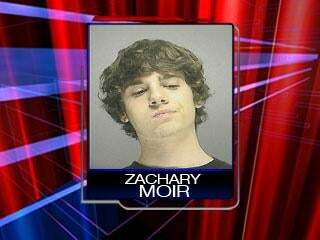 Zachary Moir, 19 (though mentally about 7 and 3 months), was arrested under charges of assaulting his mother— with a taco—because she unplugged his Xbox when he wouldn't come downstairs for dinner. When he refused to stop playing his X-box and come down for dinner, Dena Moir says she went upstairs and unplugged the game, that's when she says Zachary pushed her and called her a bad name...A few minutes later Dena says she was in the kitchen cleaning and cooking tacos for dinner when Zachary showed up. That's when she says he slapped her arm and threw a taco in her face. Tired of "Mortal Kombat Killer"? How About "Xbox Taco Assailant"